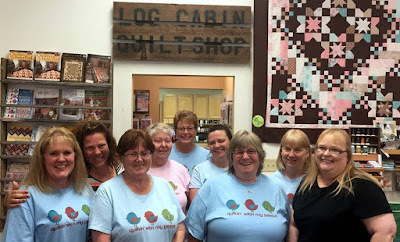 Jean's Quilting Page: Colorwheel Stash Group exploding with color! The Colorwheel Stash Group met last week and had a great time seeing what each person had done to their quilt in the weeks since the last time. 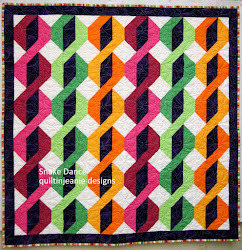 Lora quilted hers diagonally on her home machine. She then started adding beads to it. She is hanging it and using it to display pictures, so wanted the beads mostly around the edges. Dorothy got her center finished and worked on getting her border sewn on. She decided on white, which really showed off the colors. Kelli put a ruched border on hers. We were intrigued by this idea, but loved it. She is not sure if she will use traditional binding or try something else. 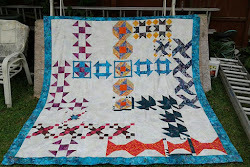 She also quilted it with her home machine, trying out some stars and squiggly lines. Dianne worked on her beading again, she is placing groups of beads and also decided to use this trim as well. She has it in several colors. These are some closeups of some of the various beading techniques they are using. 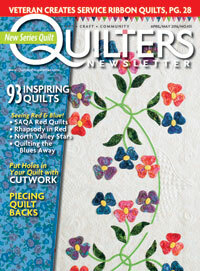 I find that everyone has their own ideas of what fits where when they are beading or adding other textures to quilts. It's a very personal venture, so it's interesting to see what they did.This was Kelli and Lora's first beading attempt and I think they really got into it. Dianne loves it and couldn't wait to get started last time on her beading! We've been meeting since the class to keep exploring what we can do with these squares as well as try different techniques. We all know about my attempt at thread art...so I showed them what I had done. I think they found it interesting. I auditioned a few fabrics for the binding, and made it, just need to get it sewn on now. I also finished sewing my 6 x 6 blocks. Now to figure out exactly what I'm going to do with them! Oh gosh, I love them all! I would have to add some serious yellows and oranges to my stash before I could make a quilt like this...may need to think about that!